Danielle Hunter has the fourth highest sack total by someone before age 24 since the NFL made sacks an official stat. But how often has he been called for roughing the passer? 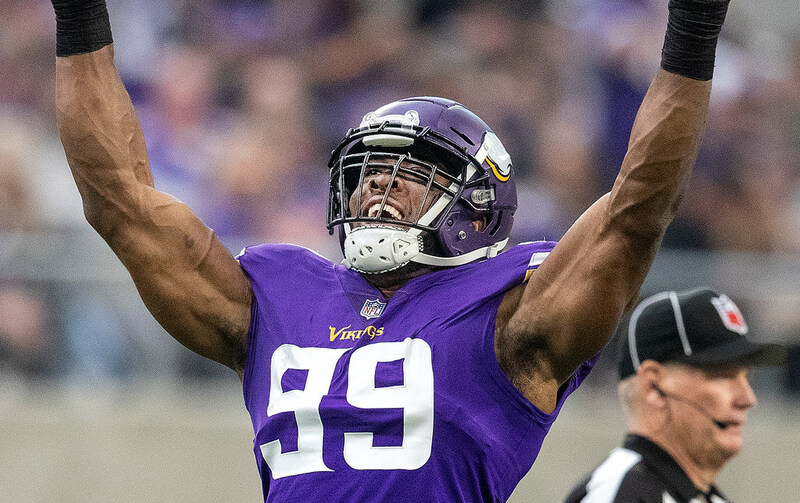 With two more games until he turns the ripe old age of 24, Vikings defensive end Danielle Hunter is deadlocked with J.J. Watt for the NFL lead in sacks with seven. At 29, Watt already has a resume that’s ready for consideration in Canton, Ohio. He has three Associated Press NFL Defensive Player of the Year honors, four first-team All-Pro nods and 83 sacks in 94 games. Here are the NFL sack leaders through the first six weeks of the season. Hunter, meanwhile, has 32 1/2 sacks in 52 games, which includes just 23 starts. With two sacks last week — the fourth multi-sack game of his career — Hunter now has the fourth highest sack total by someone before age 24 since the NFL made sacks an official stat in 1982. Only Shawne Merriman (39 1/2), Aldon Smith (38), Robert Quinn (34 1/2) and Terrell Suggs (33 1/2) are ahead of him. In two seasons before his 24th birthday, Watt had 26 sacks. Has Hunter ever been penalized for roughing the passer? Can’t seem to recall many flags for any reason being thrown at his feet since he entered the league in 2015. –2018: One penalty for defensive holding. Five yards. –2017: One penalty for neutral zone infraction: Two yards. –2016: One penalty for illegal use of hands: Five yards. –2015: Two penalties. One for illegal block above the waist on special teams (10 yards) and one for facemask (15 yards). Watt leads the Texans with eight penalties this year. Four of them are for roughing the passer.